Genuine OEM quality. Reliable and dependable so that you can count on it when you need it most. Integrates seamlessly with your printer for a quick and clean installation. Device Types: Inkjet Printer; Color(s): Magenta; Page-Yield: 1200; Supply Type: Ink. 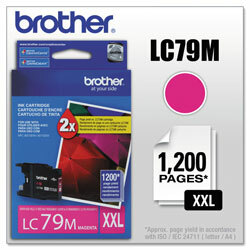 Magenta Inkjet Printer Cartridges from Brother! 366 In Stock today.